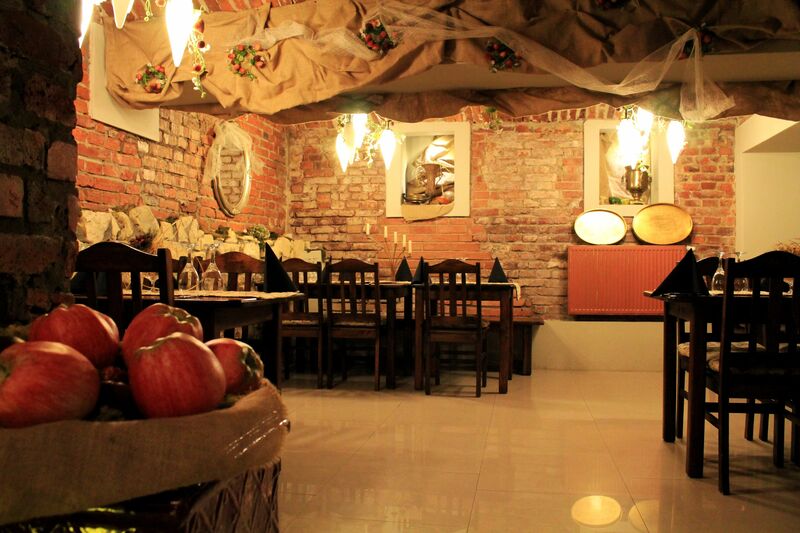 Restaurant “Sąsiedzi” located in the historic Jewish quarter of Kazimierz (Cracow) invites foodies for traditional Polish meals to the winter garden, cellars or countryside bar. 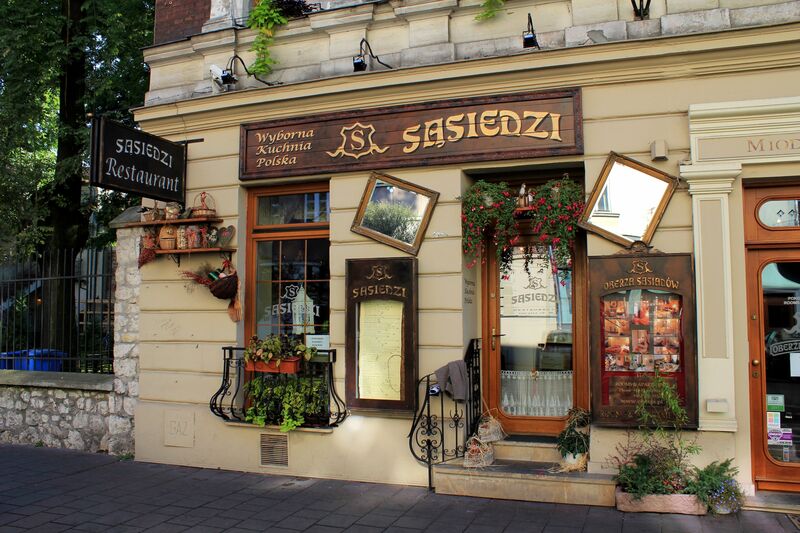 Restaurant "Sąsiedzi" (“Neighbors”) was opened in 2010 - by all accounts too recently to be widely known even among Cracovian foodies. 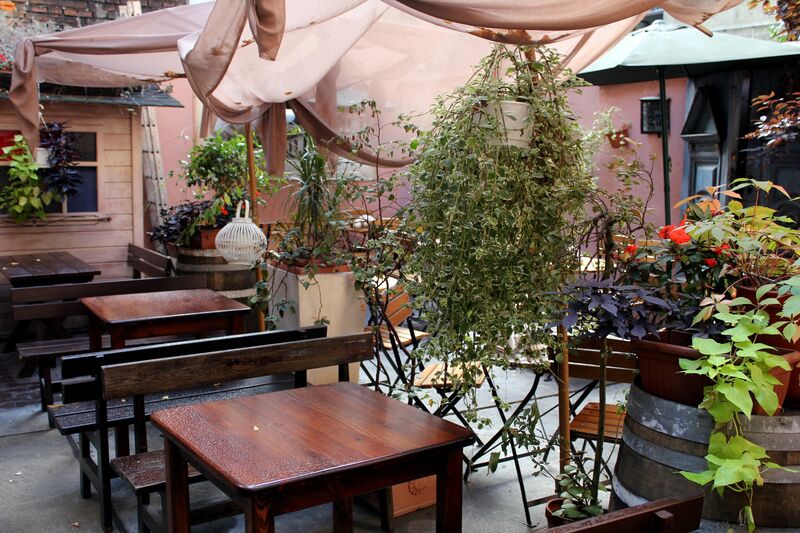 It is located in the old Jewish Quarter – Kazimierz, close to the Tempel Synagogue, but a bit away from Kazimierz’s focal points like Szeroka Street or “Plac Nowy”. An unpretentious 19th century building housing the restaurant does not help either – so it is really easy to pass-by without even noticing it. But the good news is - so far the restaurant seems to be on the right path to make it happen. Crossing the doors you enter the small room which with its beautiful balcony up on the wall, few tables and rustic decoration looks rather like part of the street garden normally seen in front of restaurants. 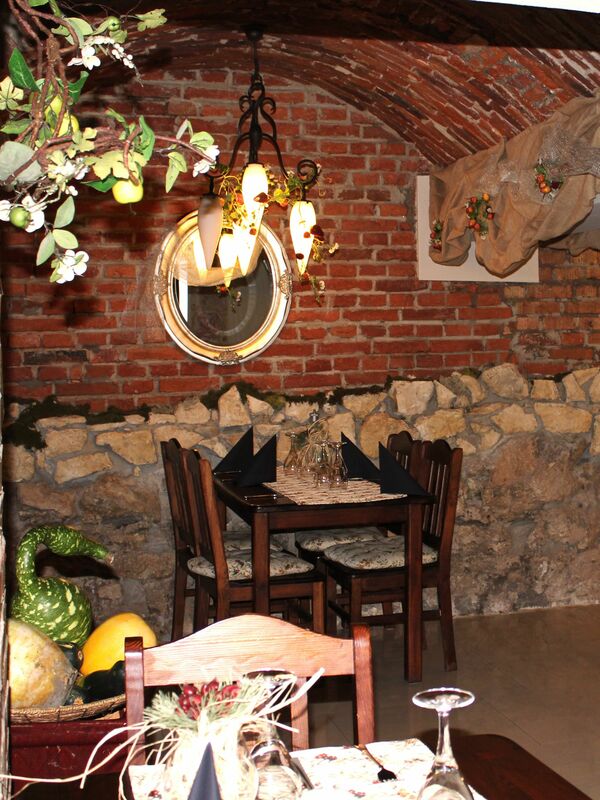 Although charming and warm, due to the lack of space the first room may be deceiving at first – at least till the moment you spot the narrow “underground” passage leading to the main parts of the restaurant – Garden and Cellars. The garden tightly fills the area enclosed between the walls of neighboring buildings. But in difference to the seasonal street gardens so popular in Krakow, this one with its glass-protected walls allows for operation throughout the year (as the matter of fact – it is called the "Winter Garden"). Cellars seem to be designed to re-create the atmosphere of the Medieval Kazimierz, but frankly, they lack this “elusive” patina of time felt in similar venues of other Old Town Krakow restaurants. The “naked-truth” is that not long ago these cellars were still used by apartments’ tenants as storage for coal and possibly all kinds of useless “stuff”. It’s quite “flat” story, far from what most of us would like to hear – kind of “…once upon a time” tale. Well, normally the 19th century building should deserve some respect, but obviously such age is not very impressive in almost thousand year old Krakow. Even legends did not find here (yet) breading ground….. However this apparent “shortcoming” is more than fully compensated by the ingeniously beautiful décor and - take my word, delicious cuisine. Cellars did not inherit any legends from the past, but the restaurant seems to be on the best way to create its own legends …..
A piece of hanging fabrics in apparent “artistic disarray”, composition of apples in the basket, lonely Russian samovar in a niche, suspended tea-pot , beautifully shaped iron chandeliers, glimmering candles …..(and list can go on an on …) are transforming these “Contemporarily-Medieval” settings into a charming place…. The honeycomb-like set of rooms in the cellars with some “unassuming” names like “Wine’s Room”, “Beer’s Room” and “Strawberries’ Room”, but also more showy like “Knight’s Room” and “Cracovian Room” offers the privacy for an intimate tête-à-tête dinners as well as comfortable settings for a larger party. Restaurant’s cuisine is another noteworthy story well “tuned” to the meticulously arranged surroundings. Promoted as a “Taste of Pleasure”, it offers the classical Polish food you may be already familiar with after spending even only few days in Cracow. But what distinguishes this restaurant from others is a very “visually appealing” way of its presentation. For example we all know shish-kebab – very popular these days across the world. We got so much used to the picture of the grilled string of marinated cubes of meat mixed with some onion, pepper and/or mushrooms and served on the skewer, that it is hard to imagine a different way of serving. Yet, the restaurant Sasiedzi made an art from this apparently “uninspiring” meal. 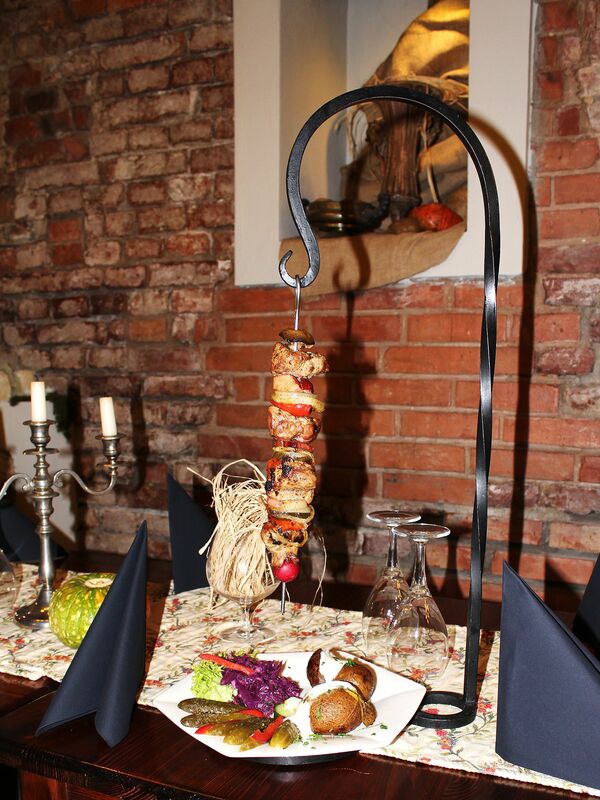 Here the shish-kebab comes on your table on the iron holder, hanging above a hexagonal plate with a little “veggie garden” on it (potatoes, cucumbers, roasted red pepper, green salad etc…). Frankly, you face a dilemma to either just keep watching this piece of art or start the “art-consumption” process. Personally I solved this “impasse” by first taking the picture and then indulging myself in the “dining” event. 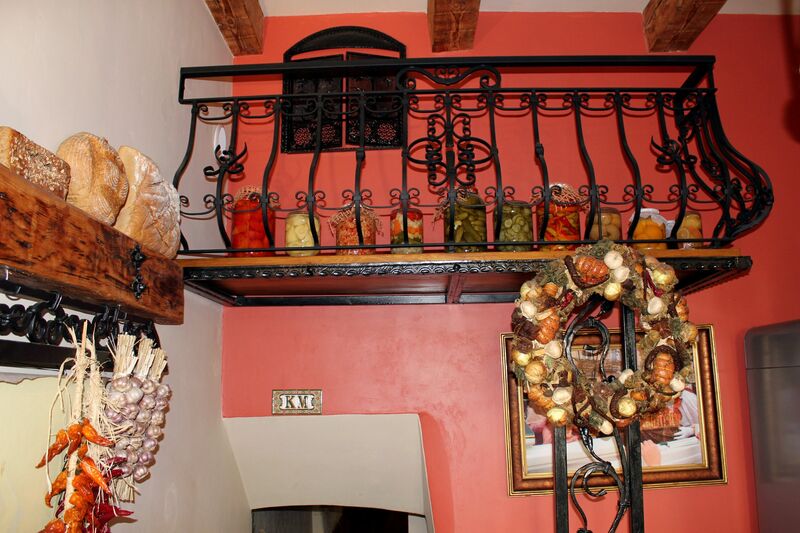 You will be also pleased by chicken breast stuffed with sun-dried tomatoes, mouth-watering potatoes-cakes with goulash, apple stuffed duck with marjoram, ribs in honey sauce…. Or larger compositions to share for few (hungry) guests like “Village Table” or “Innkeeper Plate” ….. The Creator, when he obliges man to eat, invites him to do so by appetite, and rewards him by pleasure. The only thing we – mortal humans should do to “help” the Creator is to remember that “eating” is not just a “body-feeding” process. The wonderful thing about eating is that in right circumstances we can "transform" it to an “all-senses” feast, something that certainly we deserve at least once in a while. Walking down to the cellars you will see a piano next to the stairs. Quite far from restaurant’s rooms and anyhow “isolated” by their honeycomb arrangement it may raise well-founded question about its usefulness in this place…. The surprising answer is – the piano is mainly for guests, supposedly allowing them expressing emotions, mood..... Given its good shape I assume that these are overwhelmingly positive ones! However, despite these initial limitations thanks to imagination and creativeness of Mme Dorota, the restaurant already gained recognition for its charming ambiance and it seems to be on the best way to create its own legends …..